Looking for an allergy-friendly, kosher-for-Passover dessert that's dairy-free, nut-free, margarine-free, and so delicious you'll actually want to make it year-round? This luscious flourless chocolate cake definitely fills the bill. Best of all, it's easy to make: The eggs don't need separating or whipping, and the recipe is easy to mix by hand, without special equipment. 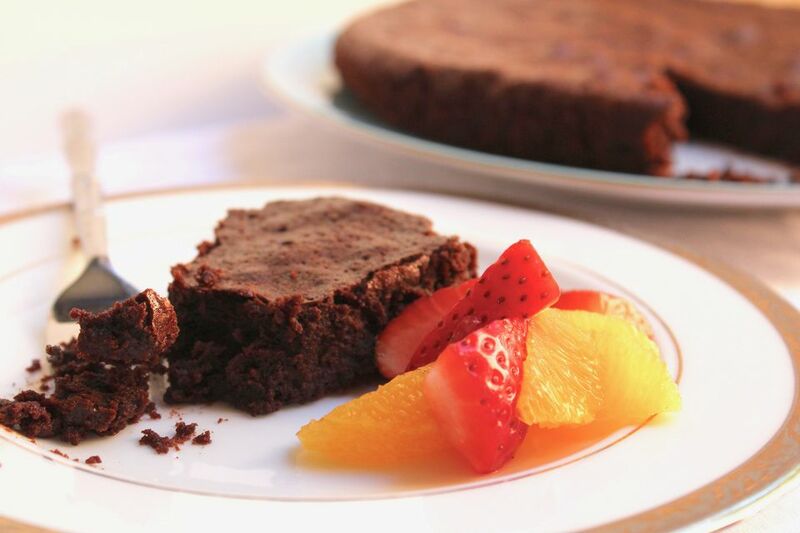 Because cocoa powder stands in for matzo cake meal, the cake is naturally gluten-free—and intensely chocolatey (but not too sweet). You can serve it solo or dress it up with fresh berries or fruit, sorbet, or whipped cream or ice cream for a dairy meal. ​Preheat oven to 350 F. Lightly oil an 8-inch springform pan and line the bottom with parchment paper. In a large bowl, combine the chocolate and sugar, mixing well with a wire whisk. Whisk in the oil, coffee (if using), vanilla, cinnamon, and salt. Sprinkle the cocoa powder evenly over the top of the batter, then whisk until it is fully incorporated. Bake in the preheated oven for 30 to 35 minutes or until the top of the cake is firm and has a thin, shiny crust and a tester inserted in the center comes out mostly clean. Place the cake, still in its pan, on a wire rack to cool. Run an offset spatula or knife around the perimeter of the cake to loosen it, then open the springform pan latch, and remove the ring from the pan bottom. Place a large plate on top of the cake, and holding both the plate and pan bottom, flip to invert the cake. Remove the pan bottom, peel off the parchment, and invert the cake back onto a cake plate or platter, so it is right side up. Serve solo or with fresh berries, sorbet, whipped cream, or ice cream.